Gorey Beekeepers offer a honeybee swarm collection service to the public that covers the north Wexford and south Wicklow area. This may incur a small charge to cover the cost of fuel and the bees will be removed and re-hived. There may be instances that the bees are inaccessible, for instance inside a high roof space or facia boards, and if they are not a nuisance, it may be better to leave them be. If the swarm is easily accessible, then it can be just a matter of sweeping them into a box. In other cases it might be that they take a few hours where the queen is in the box, but the others may take their own time strolling in, so the beekeeper might return in the evening to collect the full box. Only to point out the location of the swarm, and the beekeeper can generally take it from there. Generally it is not a good idea for children to be around, as the temperament of the bees can be unpredictable.If you think you have a swarm please leave it alone. Swarmed honeybees are usually quiet (their stomachs are full of honey) but aggravating them is not a good idea. Please also ensure what you have is a swarm of honeybees and not a wasp’s nest! 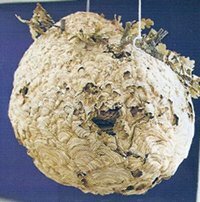 If it is a wasp’s nest, then it will be papery grey or tan, and the wasps will have bright yellow stripes.